Umar bin Jubair describes al-Baqii as he saw it during his travel to Madina, saying "Al-Baqii is situated to the east of Madina. You enter it through the gate known as the gate of al-Baqii. As you enter, the first grave you see on your left is that of Safiya, the Prophet's aunt, and further still is the grave of Malik bin Anas, the Imam of Madina. On his grave is raised a small dome. In front of it is the grave of Ibrahim son of our Prophet (s) with a white dome over it, and next to it on the right is the grave of Abdul-Rahman son of Umar bin al-Khattab, popularly known as Abu Shahma, whose father had kept punishing him till death overtook him. Facing it are the graves of Aqeel bin Abi Talib and Abdullah bin Ja'far al-Tayyar. There, facing those graves is a small shrine containing the graves of the Prophet's wives, following by a shrine of Abbas bin Abdul Muttalib. The grave of Hasan bin Ali (a), situated near the gate to it's right hand, has an elevated dome over it. His head lies at the feet of Abbas bin Abdul Muttalib, and both graves are raised high above the ground, their walls are panelled with yellow plates and studded with beautiful star-shaped nails. This is how the grave of Ibrahim, son of the Prophet (s) has also been adorned. Behind the shrine of Abbas there is the house attributed to Fatima, daughter of our Prophet (s), known as "Bayt al-Ahzaan" (the house of grief) because it is the house she used to frequent in order to mourn the death of her father, the chosen one, peace be upon him. At the farthest end of al-Baqii is the grave of the caliph Uthman, with a small dome over it, and there, next to it, is the grave of Fatima bint Asad, mother of Ali b. Abi Talib (a)"
After a century and a half, the famous traveller Ibn Batuta came to describe al-Baqii in a way which does not in any way differ from the description given by Ibn Jubair. He adds saying, "At al-Baqii are the graves of numerous Muhajirin and Ansaar and many companions of the Prophet (s), except that most of their names are unknown." 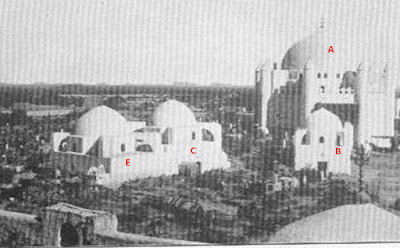 Thus, over the centuries, al-Baqii remained a sacred site with renovations being carried out as and when needed till the Wahhabis rose to power in the early nineteenth century. The latter desecrated the tombs and demonstrated disrespect to the martyrs and the companions of the Prophet (s) buried there. Muslims who disagreed with them were branded as "infidels" and were subsequently killed.